« “NOIR: The 3D/4D Semi-Cinematic Satirical Thriller” Opens September 12! Given the choice, if I could resurrect one attraction from Universal Orlando’s past? It would be the Jaws ride without question. Aside from it being one of the best immersive attractions of all time, the history of The Jaws Ride may be some of the best stories you’ll hear about the theme park industry anywhere. Luckily, there is a new Jaws ride book that was recently released all about the much-beloved attraction. And you need to buy it immediately. 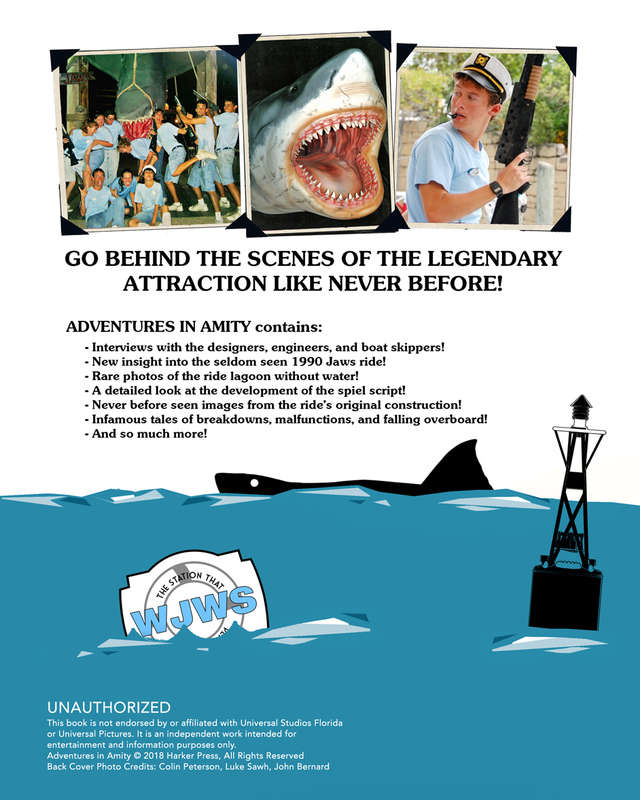 Adventures in Amity: Tales From Jaws The Ride features over 200 photos (some never-before-seen) from the construction and early days of Universal Studios Florida. It also features over 30 interviews from various perspectives of people who worked on Jaws. From Universal executives to Captain Jake’s Amity Boat Tour Skippers, you’re guaranteed to learn a few great nuggets about Jaws, no matter how big of a fan you are. 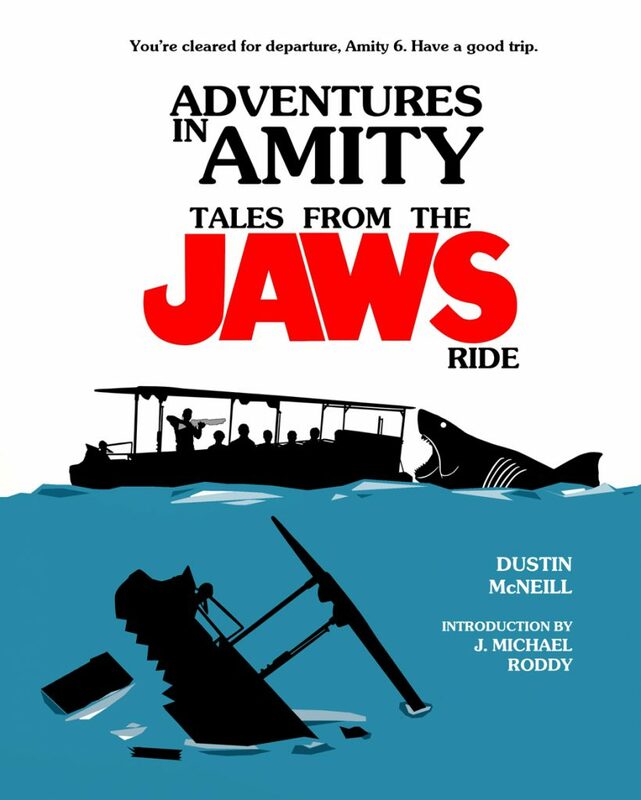 I recently got a chance to interview the author of this new Jaws ride book, Dustin McNeil about what it was like to put together this unique collection of stories, photographs, and history of one of the most beloved attractions from theme park history. 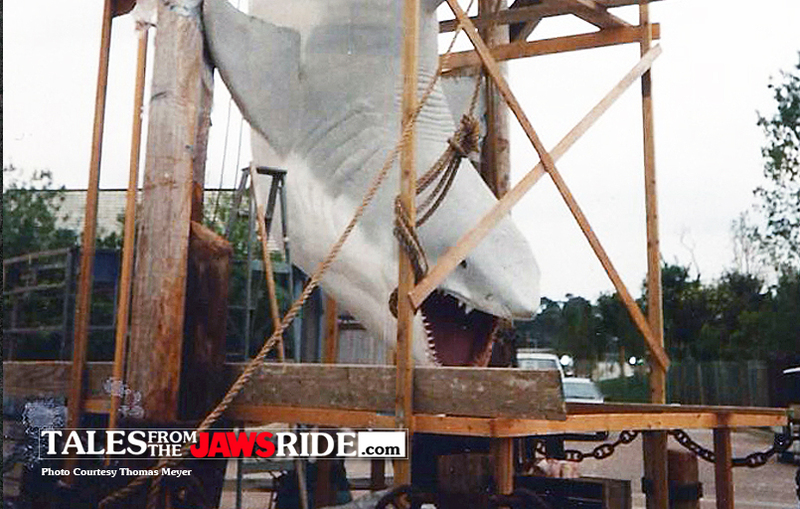 Also featured are several images found insideAdventures in Amity: Tales From Jaws The Ride. Enjoy! What intrigued you enough to write a book about The Jaws Ride? Jaws has long been one of my all-time favorite films, so it was only natural that the Jaws ride would have been one of my all-time favorite rides. I think the attraction embodied what made Universal Studios Florida such a special place in the 90’s during its “ride the movies” era. As for writing a book on it, I tend to write the kinds of books I really want to read and I’ve long wanted to know more about the Jaws ride. Why do you think there is such an intrigue about this attraction? I think it owes partly to the ongoing fascination with the Jaws brand itself. The 1975 movie is still such a powerhouse classic and a masterpiece of cinema. Beyond that, I just think the attraction was so immersive and fun that people don’t want to forget about it. There weren’t any 3-D glasses or screens at Captain Jake’s Amity Boat Tours. You were outside on a boat in the water and beneath those waves lurked a twenty-five-foot killer shark. That made for an incredibly visceral and thrilling ride experience. And you’re right about there being such continued intrigue about the Jaws ride. Sure, we miss Back to the Future and Kongfrontation but hop on YouTube or social media and no one is getting nostalgic for those rides on the same level they are for Jaws. People are still so bummed that Universal closed the attraction and are continually seeking out new ways to remember it whether through on-ride videos, memorabilia, or something else. What was the process like while writing the book? Who did you interview and how long has the book been in the works? Writing the book was great fun because it involved tracking down dozens of Jaws ride veterans in order to hear their terrific remembrances. I would say with confidence that the majority of stories contained within TALES FROM THE JAWS RIDE have never been told publicly before. If you think you know everything there is to know about Jaws, think again! As for time, about a year passed from first interview to publication. With regard to who was interviewed, I tried to cast a wide net in terms of who I spoke with. I interviewed park executives, shark designers, mechanical engineers, architects, attraction supervisors, and – most importantly – the boat skippers who actually ran the attraction. I spoke with people who launched the ride in 1990 as well as those who closed it in 2012. There is such a range in terms of role and time spent at Jaws when it comes to the book’s interviews. What’s the most surprising thing you learned while gathering information and stories? I already knew that the Jaws skippers enjoyed their jobs immensely. That was obvious just from watching them in action. I was surprised to learn, however, how much of a true sub-culture the Jaws ride was at Universal Studios Florida. The Jaws skippers were so passionate about their work and took enormous pride in the attraction. They continue to be a tight-knit group. One of the closing team skippers, Kayla Rhodus, told me in her interview: “In the movie Jaws, they say ‘Amity means friendship.’ At the ride, we would say, ‘Amity means friendship, but skippers mean family.” I think that sums it up nicely. I was also quite surprised to learn new details about the disastrous failure of the 1990 version of the ride. I’m not sure most people know that Jaws originally opened with Universal Studios Florida in 1990 but was shut down several months later due to ongoing technical issues. Universal sued the ride’s maker and re-designed Jaws across the next three years. The version that opened in 1993 was the one most people experienced and remember. 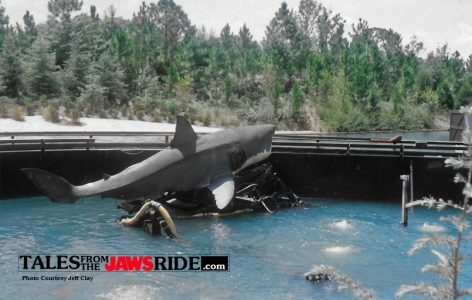 TALES FROM THE JAWS RIDE features incredibly rare photos and stories from the 1990 Jaws ride including why exactly it failed. I think it’s a fascinating part of the ride’s history that has, up until now, been shrouded in mystery. I hope people realize that if they’re still crazy about the Jaws ride, they’re not alone. That’s something I emphasize in my introduction. We may be years past the ride’s closure, but its memory still burns brightly. I think it’s a legacy that will continue to be remembered fondly by both movie fans and theme park enthusiasts for years to come. Can’t stand it anymore? The book is available now through Amazon and by clicking the link below, it helps Theme Park University pay the bills and costs you nothing extra! Thanks, as always, for doing your Amazon shopping by clicking on the links here at TPU first! This entry was posted in Universal and tagged Jaws, Jaws ride book, theme park history, Universal Orlando, Universal Studios Florida. Bookmark the permalink. Trackbacks are closed, but you can post a comment.